I started using Twitter about a year and a half ago. I have to admit, I found the social site boring during the first few months of being a member. I followed around 60 accounts during my first 2 weeks, most of them celebrities and a few friends. Aside from reading tweets about celebrities' whereabouts, I got stuck on thinking what to tweet. I had very few interaction as I was connected to a very few people whom I actually know. Now that half of my job involves the internet and involves spreading some news, I kind of fell inlove with Twitter. It's a great source of information and a great medium to spread information. I had more than a thousand followers as of yesterday (July 10, 2012) and I follow more than 300 accounts, half of those I am actually acquainted to. Let's see who are the "Celebrity Twitter Millionaires". If every follower has an equivalent of 1 peso, who do you think are the Filipino millionaires? Oops! 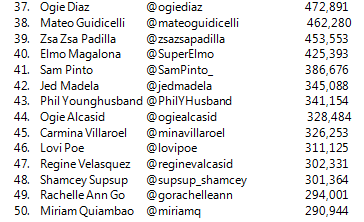 We thought only 16 celebrities comprise the very exclusive "Twitter Millionaires' List"
and well ahead of Christine Reyes. The pop star princess is a Twitter princess too! 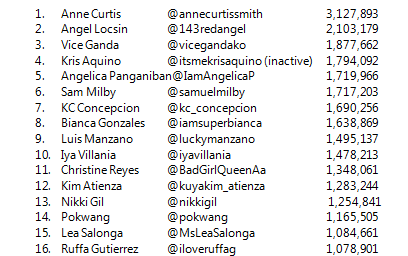 As of the numbers I saw on Twitter by 5:30 pm of July 10, 2012, Anne Curtis is still the undisputed Twitter Queen of the Philippines. She has 3.1 million followers! There are about 8 million Twitter users in the Philippines and about 40% of those follow Anne Curtis. Anne started early of course and is very active on this social site with 18, 797 tweets posted! It's quite obvious as well that ladies dominate the Twitter millionaires' list. 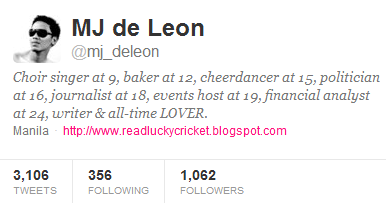 Of the 16 "Twitter millionaires", only Sam Milby, Luis Manzano, Kuya Kim, and well, Vice Ganda are male. The pretty faces of Philippine showbiz are on the list starting from Anne Curtis, to Angel Locsin, Angelica Panganiban, KC Concepcion, Iya Villania, Nikki Gil and Christine Reyes. TV Host Bianca Gonzales made it to the list as well while Lea Salonga is the only singer to make it to the millionaires' list. Ruffa Gutierrez is also the only beauty queen and Pokwang joins Vice Ganda to represent the comedians. Xian Lim is on his way to be a Twitter millionaire. Yahoo OMG's Breakthrough Actor for 2012 just needs less than 90,000 followers to hit the one million mark. That makes me believe that if Kim Chiu has a Twitter account, she will be giving Anne Curtis and Angel Locsin a run for their money now. 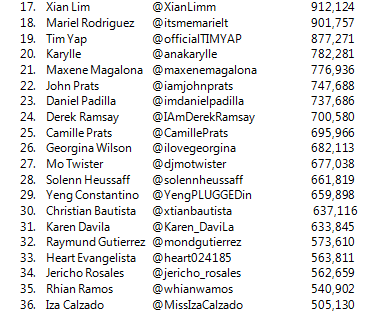 One of the first celebrities to join Twitter, Tim Yap is ranked 19th with 100,000 followers more to go to one million. Maxene Magalona is the highest ranking "Kapuso" star, while Solenn Heussaff follows. If siblings John and Camille Prats are to combine their Twitter accounts, and if that is allowed, they can easily join the millionaires' list. Mo Twister is the only disk jock to be in the Top 50, on the other hand, Karen Davila is the only news personality to be in the Top 50 list of the Philippines' most-followed Twitter users. and K Brosas has 347,265 followers which place her at 42nd. 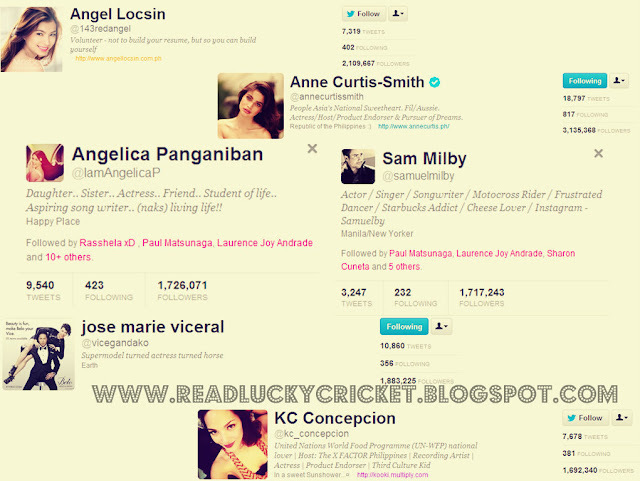 Valerie Concepcion, meanwhile, has 411,569 followers and should ranked 41st. It's also quite interesting to see ex-lovers Heart Evangelista and Jericho Rosales almost having the same number of followers. Heart just leads Echo with 1,200 followers. Iza Calzado narrowly joins the "half-a-millionaires' list" while Miss Universe 1999 First Runner-up Miriam Quiambao just ranked ahead of other Twitter celebrities including Annabelle Rama to join the Top 50. The very controversial Annabelle Rama has more than 200,000 followers as of press time. Ogie Diaz is the only showbiz columnist to be in the Top 50. For sure, he will be joined by Joebert Sucaldito and Cristy Fermin once they sign up for Twitter. Fairly new to Twitter, the songbird Regine Velasquez is ranked 47th with more than 300,000 followers while Phil Younghusband is the only sportsman to make it to the list. His brother James has 85,000 followers. The Elmo-Julie Anne craze on TV is also extended to the internet as Elmo Magalona has nearly half a million followers. Well, the title is only hypothetical, as what I mentioned, and will only come true once Twitter decides to pay 1 peso for every follower earned by these celebrities. If that will materialize, then I will campaign very hard to recruit friends to follow me! To be honest though, my main social network, like almost everyone of us I think is Facebook. Though I am starting to really be addicted to Twitter's very instant, and often times first hand, access to information (and gossips).